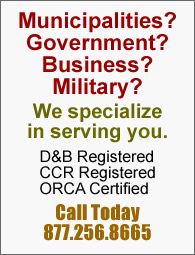 CCR Registered - SAM Registered For U.S. Government and Military Sales. Summit Equipment is a distributor and wholesaler of construction equipment and material handling equipment. We sell direct from the manufacturers to you, which means we can offer the best possible prices while still giving you the exceptional customer service that you expect and deserve. Our top priority is customer service. We believe taking care of you, our customer, is more important than the sale. If you're needing something and don't see it on our website, feel free to give us a call or contact us with our easy contact form to see if we can help.